What Causes Strawberry Plants to Wilt? Q: What Causes Strawberry Plants to Wilt? Just bought a strawberry plant in St Augustine last week. It was doing fine for a week, gorgeous green large leaves and some fruit. Today most of the leaves just wilted (drouped). I gave it adequate water. What are the problems? Answer to: What Causes Strawberry Plants to Wilt? It is hard to say for certain. If the plant was started and grown indoors and just recently placed outdoors without “hardening” the plants by exposing them to direct sunlight incrementally, the exposed leaves could have been killed. If this is the case, more should grow from the crown to replace the dead leaves. This taxes the plant somewhat, but it should survive. If your plant is afflicted by one of the many strawberry diseases or pests (see the Strawberry Plant page for more details), it might be on its way to meet the plant grim reaper. A good many nurseries and stores that sell live plants have a guarantee that the plants they sell will live for at least a certain period of time. If your plant does indeed die, see if you can get a refund or exchange from the nursery from which it was purchased. 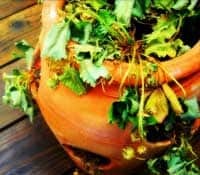 And, for more potential causes of your plant’s malady, be sure to see the much more in-depth article on wilting strawberry plants. Good luck! I planted 3 different varieties of new strawberry plants in my poly tunnel last year and they fruited very well but unfortunately are all dead this year. What are the causes of this please? Unfortunately, there could be a number of reasons. It could be that they got a fungus infection or succumbed to another strawberry disease. Or, if they weren’t insulated well enough, they could have suffered cold injury when the cold front came through in February. Or, if they didn’t get enough water, they could have died for that reason. Hard to say for certain. Sorry, and good luck this year!